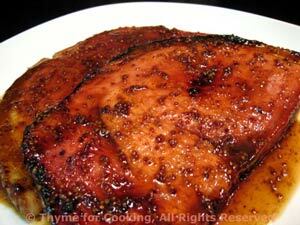 Grilled Ham Steak with Red Eye Glaze, easy recipes, Thyme for Cooking. A Southern Classic, moved to the barbecue grill. The glazed is boiled to reduce it a bit, then used both to baste the ham and as a finishing sauce. As the ham is already fully cooked, this is a very quick dish. Mix sugar, coffee, mustard and vinegar in a small saucepan. Boil for 5 minutes, reducing by half. Cook ham on the barbecue grill, 5 - 7 minutes per side, basting with the Redeye Glaze until ham is a lovely mahogany color. Or sauté in olive oil in nonstick skillet for same amount of time - until it starts to brown. Pour any remaining glaze over the ham and serve. . As ham is cooked there is no problem using basting sauce to finish.